It goes without saying that one must be a Jew, part of the nation of Israel, before one is qualified for inclusion as a constituent member of the synagogue. However, this did not absolutely ban Gentiles either from attendance at the weekly Sabbath meetings, or from becoming a part of the congregation through the conversion process. Acts is replete with example after example of interested Gentiles, whether proselytes or not, in attendance, often in great numbers, at the Sabbath synagogue service (see, e.g., Acts 13:44; 14:1). Is it significant that the process of conversion is stated in a way as to encompass only men? The Mishnah does discuss female proselytes in several places.3 On the question of female membership in the synagogue, see below. Whether a baptism was in fact part of the process by which a Gentile become a proselyte to Judaism in the first century A.D. is very much in dispute. John Gill has treated the subject in very great detail.4 He demonstrates with great persuasiveness that proselyte baptism is not mentioned in connection with the conversion process, at least as far as the evidence of extant Rabbinic literature goes, until the Jerusalem and Babylonian Talmuds (ca. A.D. 350 and A.D. 500, respectively). The various ritual washings of the Jews, whether prescribed in the Law or based in Rabbinic tradition (or even practiced at Qumran), are much beside the point, since they were not peculiar to the conversion process. Of course, if there was no first century proselyte baptism, then it necessarily follows that neither John’s baptism nor that supervised by Christ or practiced by the Apostles both before and after Pentecost could have been based on, inspired by, or in any way linked to proselyte baptism. Indeed, the inverse seems to be much more probable. The NT mentions proselytes to Judaism on several occasions. Jesus remarked on the strenuous efforts of the scribes and Pharisees to make a single proselyte (Matthew 23:15). The multitude in Jerusalem for Pentecost included “the dwellers at Rome, both Jews and proselytes” (Acts 2:10, 11). Among the first six deacons was one “Nicholas, a proselyte from Antioch” (Acts 6:5).6 In the synagogue in Pisidian Antioch, Paul addressed “many of the Jews and pious proselytes” (Acts 13:43). In no case is the term “proselyte” clearly applied to women in the NT. When women are considered, the term is “pious” (sebomenos): “The Jews provoked the influential pious women” in Pisidian Antioch (Acts 13:50), after proselytes had already been mentioned (v. 43, modified by the word sebomenos!). Lydia is described as a “worshipper of God” (sebomene ton theon). Other uses of “pious” with reference to Gentiles include those at Thessalonica in Acts 17. After Paul spoke three weeks in the synagogue, “some of them [i.e., Jews, v. 2] were convinced and associated themselves with Paul and Silas, and a great multitude of the pious Greeks [sebomemon ‘Ellenon], and not a few of the pre-eminent women” (Acts 17:4). All these converts were drawn from the synagogue attendees. One would surmise that by definition, “the pious” would naturally be assumed to be Greeks, so the epithet “Greek” seems redundant. And what about these women? Were they not “pious” also, just as one assumes that they were also Greeks? The question cannot be answered with complete confidence, but it certainly seems so. Then when Paul went to Athens, “he reasoned in the synagogue with the Jews and with the ‘pious’ ones” (Acts 17:17; Greek, tois sebomenois). There are two other NT terms of similar semantic range with sebomenos, namely phoboumenos and eusebes, both of which are applied to Cornelius who is said to be “reverent and fearing God” (Acts 10:2; Greek, eusebes kai phoboumenos ton theon). Eusebes is also used of one of Cornelius’ subordinate soldiers (Acts 10:7). Cornelius’ own messengers to Peter describe him as “righteous and fearing God” (dikaios kai phoboumenos ton theon, 10:22). Peter picks up the same phraseology in his remarks to Cornelius: “In every nation he who fears Him and works righteousness (Greek, ho phoboumenos auton kai ergazomenos dikaiosunen) is acceptable to Him” (Acts 10:35). Cornelius obviously was not a full-fledged proselyte, a fact which may help clarify the usage of the terminology applied to him. In the synagogue in Pisidian Antioch, Paul addresses the two constituent groups in his audience, “Israelites and those who fear God” (hoi phoboumenoi ton theon, Acts 13:16), meaning the Jews (including the full proselytes?) on the one hand, and the interested (but not fully converted?) Gentiles on the other; and again, Paul addresses them as “Sons of the race of Abraham, and those among you who fear God” (hoi en humin phoboumenoi ton theon, v. 26). Schaff notes the two kinds of Gentile converts to Judaism. Simply because a person was a Jew by birth or a complete proselyte did not automatically guarantee him permanent membership in the synagogue. Conditions were established for maintaining membership, and, when necessary, for punishing or even excluding what were deemed to be seriously errant members. The NT gives some examples of synagogue discipline. The most notable is the man born blind whom Jesus healed on the Sabbath, as recorded in John 9. According to v. 22, “The Jews had agreed that if anyone confessed Him [to be] the Messiah, he would be excluded from the synagogue.” When the man refused to budge from his testimony about Jesus, the infuriated Jews, “cast him out” (9:34). The threat of exclusion from the synagogue intimidated many believers in Jesus. John 12:42 records, “Even so, many from among the rulers believed in Him, but because of the Pharisees, they were not confessing [it], so that they would not be excluded from the synagogue.” Jesus forewarned the Apostles, “They will exclude you from the synagogues” (John 16:2). He may have had this in mind when He said, “Contented are you whenever men hate you and whenever they exclude you and rebuke [you] and reject your name as evil for the sake of the Son of Man” (Luke 6:22; emphasis added). Since much of the charity for the aged, widows, orphans and strangers was channeled through synagogues, to say nothing of the social problems caused by excommunication, to be excluded from the synagogue had potentially very serious implications. Another form of synagogue discipline involved scourging, which apparently was a lesser (!) punishment than exclusion or excommunication. Jesus forewarns His disciples of such treatment: “But beware of men. For they will betray you to the counsel and they will whip you in the synagogues” (Matthew 10:17). In His scathing denunciation of the hypocritical, self-righteous Pharisees, Jesus said, “Because of this, see, I am about to send to you prophets and wise men and scribes. Some of them you will kill and crucify, and some of them you will whip in your synagogues and harry from city to city” (Matthew 23:34). Paul, who had persecuted (“disciplined” is probably the word he would have used in his pre-conversion days) Christians, was himself the object of this brutal treatment in the synagogues: “Five times I received from the Jews ‘forty [lashes] minus one’ ” (2 Corinthians 11:24). Herem or anathema, which meant absolute exclusion from the congregation, which he equates with aposunagogos in John 9:22; 12:42; 16:2. Nidduy, a conditional or temporary exclusion (chiefly a Mishnaic term), which he says corresponds to aforizein in Luke 6:22, and parallels ekballein ek tes ekklesias, III John 10 (on which, see below). Neziphah, a severe public reprimand which probably carried a required seven day seclusion. Shammata, a handing over to “desolation,” which he equates with paradounai toi Satana in I Corinthians 5:5 (on which, see below). Lut (literally, execration), a milder form of shammata employed by the Talmudic leader in Babylon. As in the synagogue, the NT churches had a practice of discipline of errant members. The first mention of such discipline is in the instruction Jesus gave the disciples about how to deal with a brother who commits an offense. The climax of the sequence is “But if he ignores them [i.e., the two or three witnesses], speak to the congregation, but if he ignores the congregation, treat him as a Gentile or a tax-collector” (Matthew 18:17), which means as one who is unregenerate and therefore disqualified for membership in the congregation. Paul’s letters have several actual examples of church discipline. The best-known of these is in I Corinthians 5, involving a man guilty of sexual immorality. Paul instructs the church (“when you are gathered together,” v. 4) to “hand over the [unrepentant perpetrator] to Satan for the destruction of the flesh, so that the spirit would be saved in the day of the Lord” (v. 5). The exact meaning of the Apostle is in dispute (and need not be entered into here), but Paul certainly expected the man to be expelled from membership in the congregation. Paul tells them that rather than boasting, as they had done, they should have removed the offender from their midst (v. 2). Likewise, with the individual thus excluded (and others excluded for various enumerated offenses), they were not to eat (v. 11), which may be either social meals, or a reference to the Lord’s supper, the one a personal, the other an ecclesiastical disassociation. In his second letter to the church at Corinth, Paul writes of the need to restore a brother who had been punished by the church, in light of his apparent repentance (2 Corinthians 2:5-11). This may be “the rest of the story” first presented in I Corinthians 5, or it may involve a different individual in a separate case. Under either circumstance, the church discipline had its intended effect: restoration through repentance and forgiveness. Paul’s second letter to the Thessalonians also contains instructions about the exercise of discipline against an erring brother in the church. “If anyone does not obey our message through this letter, note him. Do not associate with him, so that he may be ashamed” (II Thessalonians 3:14). One hopes that Diotrephes himself was soon subjected to proper church discipline. The churches, then, like the synagogue, had and exercised a variety of forms of discipline, including isolation and excommunication. The NT, however, knows of no corporal punishment inflicted by the congregation, whether whipping or beating. The desired goal of all discipline was restoration rather than simply punishment. 1 Philo Judaeus, The Special Laws, Book 1, paragraphs 51, 52, in The Works of Philo, translated by C. D. Yonge, p. 538. 2 Yebamoth, 47a-b, quoted in C. G. Montefiore and H. Loewe, A Rabbinic Anthology, pp. 578-579. 3 Danby, The Mishnah, Yebamoth 2:8 (p. 220); 6:5 (p. 227); 8:2 (p. 229); etc. 4 John Gill, A Complete Body of Doctrinal and Practical Divinity, pp. 995-1,023. 5 Paul F. Stuehrenberg, The Anchor Bible Dictionary, ed. by David Noel Freedman, 5:504. For some additional authors and their opinions, see the digest in Augustus H. Strong, Systematic Theology, pp. 931-932. 6 He could well have the distinction of being in a very literal sense, the first “anabaptist” known by name. If he had undergone proselyte baptism in his conversion to Judaism, when he became a Christian he would have undergone a “rebaptism,” this time in obedience to the command of Christ. Of course, any unnamed proselytes at Pentecost (Acts 2:11) who became believers would have been first to have this distinction, if in fact proselyte baptism was practiced this early. 7 F. F. Bruce, The Acts of the Apostles, pp. 215, 85. 8 William F. Arnt and F. Wilbur Gingrich, A Greek-English Lexicon of the New Testament, p. 715. 9 E. H. Plumtre, Dictionary of the Bible ed. by William Smith, vol. 3, pp. 2605, 2606. 10 Philip Schaff, History of the Christian Church, vol. I, p. 87. 11 Kaufmann Kohler, A Dictionary of the Apostolic Church, ed. by James Hastings, vol. II, p. 545. 12 See John Gill, A Body of Divinity, pp. 855-856; Edward T. Hiscox, Principles and Practices for Baptist Churches, pp. 61-82; W. T. Conner, Christian Doctrine, pp. 259-262. Some today challenge the very concept of “church membership,” ignoring some very basic matters both Biblical and legal. First, the power to exclude someone from the church necessarily presumes the power to include someone in the church, which, whatever it is called is de facto church membership. And who is qualified to select the pastor and other officers? Just anybody who happens to show up for the election? Second, who has the right to purchase, hold, and dispose of the church’s property (and potentially receive a distribution of a portion of its assets) unless there is an established listing of qualified persons, again, a de facto membership list? I have really enjoyed this series and gained some new insights! Thank you, Douglas Kutilek! You are spot-on about the difference between a God-fearing gentile and a proselyte. And, although I do not agree with John Gill's view, I did not even know he had done extensive research there. Gill is an important resource. I would like to suggest an alternate view, however, about baptism. In the first century, the School of Shammai dominated, and it wasn't until well after the destruction of Jerusalem (in a sense provoked by the School of Shammai because their theological views at least indirectly supported the Zealots ) that the School of Hillel dominated. That is why -- after Hillel's views become established --we see a clarity about baptism in the Talmud. The origin of baptism is the washing (e.g., Leviticus 15:8) -- mikveh -- commanded in the Torah. We have archeological evidence of the common existence of baptisteries (immersion places) in Israel at the time. Thus, when a convert to Judaism washed for the first time, he became ritually "clean" (at least at sunset). That initial washing, therefore, likely evolved into proselyte baptism. Kind of like a Catholic's first communion. Since Shammai wanted to make salvation difficult and Hillel easy, and since Shammai wanted to make conversion difficult and Hillel easy (the Talmudic quotation Br. Kutilek shared evidences that), it is natural that Hillel would choose the ritual shared by both male and female -- baptism -- as the marker of conversion. As far as forgiveness of sin and heaven goes, it is important to distinguish between the views of Shammai and Hillel. Shammai said that unless one was circumcised and became a full convert to Judaism, he could not be saved. Hillel said that if a gentile repented of his gross sins and turned to the God of Israel as the only God, he could be saved without circumcision or full conversion to Judaism. This difference played itself out in the church in Acts 15, and predated the church! I have discussed this in more detail in my first book, The Midrash Key, for those interested! 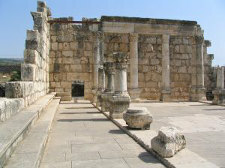 The School of Shammai dominated at the time of Jesus, but all modern Judaism has descended from the School of Hillel.